The inaugural Summer Undergraduate Research at Florida (SURF) introduces prospective Ph.D. students to research opportunities at UF. Undergraduate students who are interested in pursuing a Ph.D. degree can now experience UF’s collaborative and multidisciplinary research firsthand. 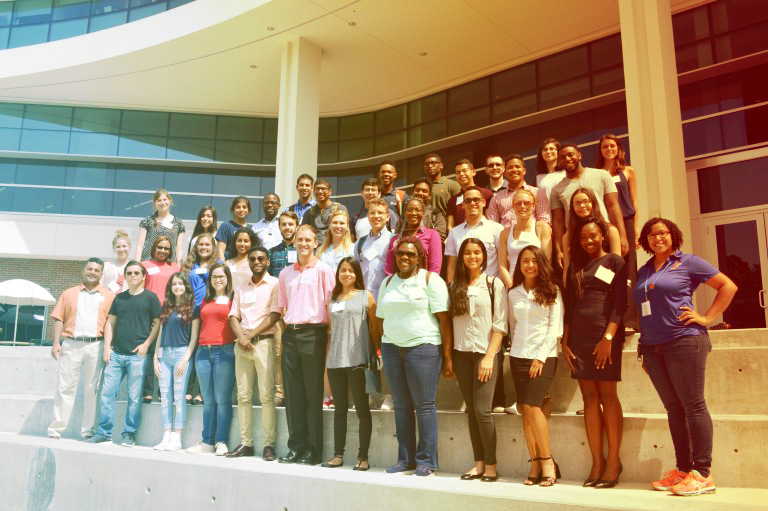 The inaugural Summer Undergraduate Research at Florida (SURF) program is a 10-week immersive experience for high-performing students who are currently pursuing a bachelor’s degree in their home institution. The first SURF cohort consists of 40 students from 23 universities in 16 states, as well as Puerto Rico. Of the 40 students, 21 are pursuing research at the Herbert Wertheim College of Engineering, nine at the College of Pharmacy, and five, each, at the College of Liberal Arts and Sciences and College of Agricultural and Life Sciences. The diverse inaugural class – 55% female and 75% from an underrepresented minority background – averages a 3.72 cumulative undergraduate GPA. Upon successful completion of the program, eligible “SURFers” receive preferred Ph.D. admission and fellowship offers to UF. Mike Nazareth, Director for Graduate Recruiting and Undergraduate Research at UF Engineering, implemented SURF with support from college Dean Cammy Abernathy and UF Provost Joe Glover to continue UF’s culture of innovation and collaborative research. Last fiscal year, UF received a record $724 million in research awards and was ranked third among all research universities for technology transfer by the Milken Institute. The university recently announced a major initiative with plans to hire 500 new faculty to further enhance teaching and research at UF. Most costs for SURF participants are paid by UF including room and some board, a $5,000 summer stipend, round-trip flights/mileage to Gainesville, summer workshops, social events/activities and a GRE test prep course.